The film opens at a Diwali fair—always a sign of grim things to come, especially when a pair of brothers are getting matching tattoos. Young Ajit is there with his older sister Laxmi (Padmini Kapila), his father (Bharat Bhushan) and little brother Munna. 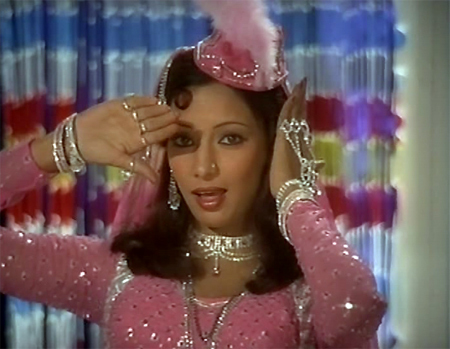 Unfortunately, Laxmi’s beauty captures the attention of a wealthy local man named Sangram Singh (Dev Kumar). Before the day is out, Ajit’s father has been murdered by Sangram Singh and his equally lecherous pals Dharamdas (Rajan Haksar) and Nandan (CS Dubey). They have raped Laxmi, who then stabs herself, and poor little Munna has been tossed into the raging river. Ajit himself is left for dead after he falls down a riverbank, but he hauls himself up in time for last-minute instructions from the dying Laxmi. Out of the three men, only Nandan is known to Ajit. All he knows about Sangram Singh is that he has gold teeth, and that Dharamdas has a large scar running down his back. Ajit tracks Nandan down the next day and kills him with the same knife that was used to kill his father, and then used by Laxmi to kill herself. As Sangram Singh’s men pursue him, Ajit escapes on Nandan’s horse and then jumps on a train bound for Bombay. 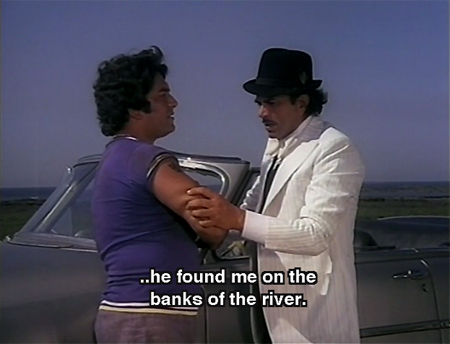 Meanwhile, tiny Munna with his Shiva tattoo that matches Ajit’s has washed up alive on the banks of the river and is found by a drunk named Khairatilal (Johnny Walker) and his wife (Shyama) who take him home. In Bombay, Ajit briefly befriends a footpath kid named Mohan after thrashing him in a boyish altercation and then patching him up in remorse. Mohan promises to help him out. He teaches Ajit how to steal, but they are separated one day when the police chase them. Mohan hides in a temple, where the priest prevents the police from arresting him not once, but twice: Mohan repents of his sins and stays with the priest, while Ajit finds shelter with a smuggler named Murli (Hiralal). Years pass, and Mohan grows up to be (director) Arjun Hingorani and opens a school for wayward boys. Ajit grows up to be Dharmendra, a wealthy man called Raja Sahab by respectable society and Sakhi Lootera by the police (although everyone seems to know that Raja Sahab and Sakhi Lootera are the same person, i.e. Ajit). They are a seriously disgusting bunch. 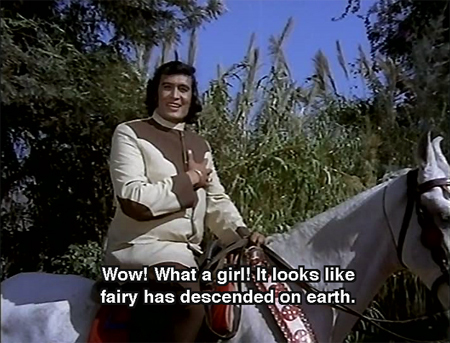 Tony (Shakti Kapoor in his debut but still incredibly creepy to me and not in a good way), Sony (? 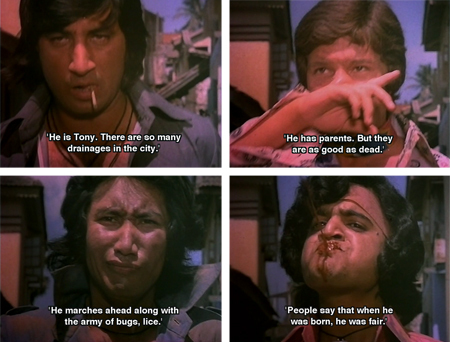 the most benign one), lice-ridden Rana (Phansok, a skinny Danny Denzongpa wannabe) and paan-stained Rahim (Mehmood Jr with truly the largest hair I have ever seen on anyone, including Sly Stone), are punks who terrorize the local neighborhood. The “ewww” factor is escalated when Ajit’s middleman fixes up a meeting with wealthy Dharamdas, who wants to buy some of their smuggled goods. And Dharamdas is in the middle of a massage when Ajit arrives. 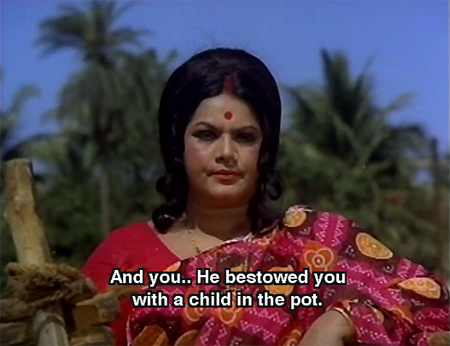 Ajit (who had *just* been complaining to Murli about how he was letting his sister down miserably) lures Dharamdas out for a drive in the countryside and kills him with The Knife. When he gets home, the gang and Munna are fighting in front of his house. Ajit convinces them all to shake hands and be friends as I marvel at his failure to see Munna’s Shiva tattoo even though it’s right in front of his eyes. Hema Malini makes a special appearance now (and again later) as a pickpocket who is a big fan of Sakhi Lootera’s. She tells Ajit that she will reform Sakhi with her love one day. It’s very cute, but kind of pointless, although I imagine they were glad for the excuse to spend some time together. The boys soon get into more mischief, and when chased by the police, they flee into an All India Students Qawwali Competition (woo-hoo!) and disguise themselves as the male half of the competition. Munna is instantly smitten by his female opposition. And who can blame him, really? Rachna (Shabana Azmi) is the niece of none other than Sangram Singh, who is still wealthy and now living in the city. Munna tells Rachna that he comes from a wealthy family too and they are soon head over heels in love. I am leaving out a mid-air jewel heist and lots of other nonsense for the sake of space, but let me just say that this is a film with so much plot it could have been made by Brij instead of Arjun Hingorani—who, as Mohan, finally manages to reform the gang after refusing to turn them in after they beat him up badly. From mischief and mayhem they turn to good works like sweeping the streets and helping little old ladies, and study hard for their exams. Mohan is suitably gratified. Alas, poor Munna is separated from his beloved Rachna when she discovers at her birthday party that he is not who he said he was. Sangram Singh is furious as well and forbids her to see him again. Munna goes into a heartbroken spiral, and his friends try to help him out by returning to theft (with Raja Sahab’s help) so that Munna can regain his lost love. Mohan and Ajit are reunited when Mohan comes to remonstrate with Ajit and Ajit recognizes Mohan’s necklace, a talisman that is his legacy from whoever abandoned him as a baby. But their joy is shortlived: their now very different morality separates them again. Sangram Singh is unnerved when he hears of his friend Dharamdas’ murder, and decides to rope in his wastrel son (Narendranath) to help him trap Ajit. He finds out from one of Ajit’s servants about the matching tattoos and duly decorates his son likewise. Hilariously, Ajit is as oblivious to this tattoo as he was to the actual Munna’s, but after some painstaking efforts by Narendranath the penny drops and Ajit embraces his enemy’s son as his own lost brother. Now harboring a snake in his bosom, and with his young friends (including his real lost brother) back on the wrong path, what will happen to Ajit’s plans for vengeance? Will he succeed against the odds? Will Munna be reunited with Rachna? Will Ajit find his Munna eventually? 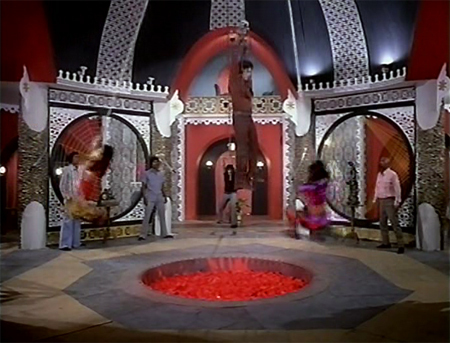 Will any of them survive the spectacular Masala Death Trap in Sangram Singh’s lair, where the only thing standing between Munna and a fiery death are a complicated pulley system and the strength of Dharmendra’s manly biceps? and then cut the rope with a knife. The mechanisms of evil have just begun to turn, too. Helen—and Sangram Singh—have more in store for poor Ajit and his straining muscles! I haven’t gone into much detail on the songs; they seem to be hard to find unfortunately (why, God, why?!) but every single one is spectacular. Trust me! And so is the funky background music. You can’t do much better if you are in the mood for a Dharmendra caper and can suspend disbelief requirements as appropriate. Your reward is an emotional journey complete with many ewwww factors, eye-popping plot points and plenty of WTF (that is a recommendation, in case you were wondering). Posted on February 10, 2010 at 3:53 pm in Hindi movies	| RSS feed You can skip to the end and leave a reply. that brings back memories. They used to bring the title song every hour or so (at least it felt like that) on the radio. I forget who are the two ladies dancing to that song? My brother went and saw the movie and narrated the story minutely in instalments. It took him nearly two weeks to complete the story. Wonder how much of his own story he infused in it! This guy Arjun Hingorani is the father in law of Anita Raaj? Ha! Caught you not reading my post! (not that I blame you)…Helen and someone I don’t recognize danced to the title song. And worked the Masala Death Trap at the same time. I think I’ll pass up Khel Khilari Ka. 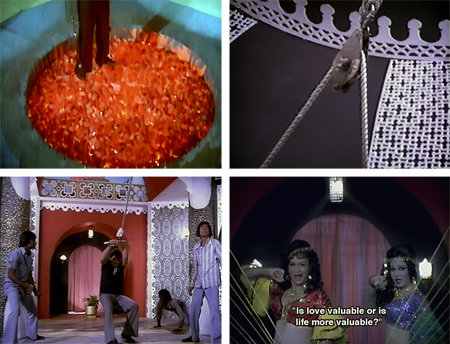 Helen and Masala Death Trap are all very well (not to mention Dharmendra, even if past his prime)… but. Anita Raaj alos has this wonderful Panchamda song picturised on her. Aisa sama na hota. She was in the same school as my sister’s best friend. And she is the daughter of our fav filmi inspector Jagdish Raaj! It’s funny, because this is a film that I realized I definitely liked because I saw it at the right time (after a bit of a break from full-on masala dramatics). Gotta pace yourself! This is strong stuff, and possibly also not very good for you ;-) That’s probably why I like it! I just looked at the title and went Woow and Ahh at the same time. Will read it today evening! ok so question: his alias is “sakhi lutera”? cos that would translate to female friend (sakhi) bandit (lutera). Im so confused!!!! I have no idea what his alias meant (except the bandit part since he was kind of a major thief). Sakhi is what it sounded like and how it was subtitled. A little off-topic but Satyamshot has a new Dharmendra Stardust cover up that is just fab. Also saw a new song (new to me)–Inteqaam loonga–where Dharam, well past his prime is still fit and fab. Maybe it meant saakhi like bartender, like int he song kaise rahu chup ke maine pi hi kya hosh abhi tak hai baki aur zara si dede saakhi aur zara si aur! Okay so it makes me feel better about my lack of Hindi skill when even people who do speak it are confused :) Thanks!!! 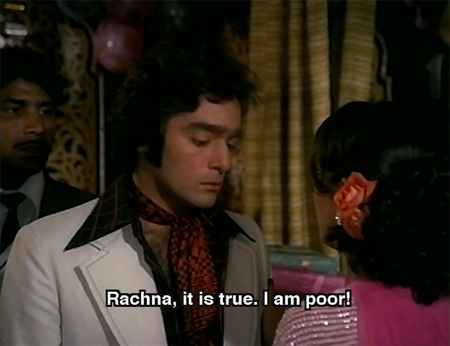 And sophy—Dharam has never gotten past his prime, LOL. He’s still fit and fab in my book! And I think you must be correct! Thanks! Yes indeed it makes a lot of sense :) Thanks. This looks like so so much fun! Love the swing-around picturization, as well as all the twistiness of the plot. Where did you find it, Memsaab? It’s on a Madhu dvd (so you don’t even get flogged by one of the more evil dvd manufacturers). So worth it! I left out a lot of little side plot detail. Especially jewel theft side plot. 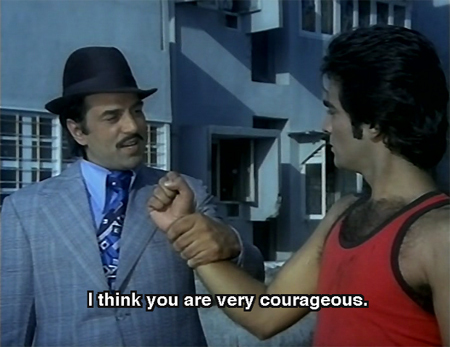 With Dharmendra in disguise. Just so fab. LoL on reading “I imagine they were glad for the excuse to spend some time together”! about dharam and hema. More so that he was a much married man with a family and their relationship was not a public thing then (until Esha came into the scene in 1982 thereabouts1). Their relationship was not a very well-kept secret, in fact I don’t think they made much effort to hide it themselves. I’ve read some eye-popping interviews in mid-70s magazines where they pretty openly talk about their love affair. I am not sure why this film isn’t as well-known as some that are much worse. Who knows? But do try and find the songs at least, they are wonderful. Worth owning the dvd just to watch them, honestly, even if you can’t tolerate the other stuff. 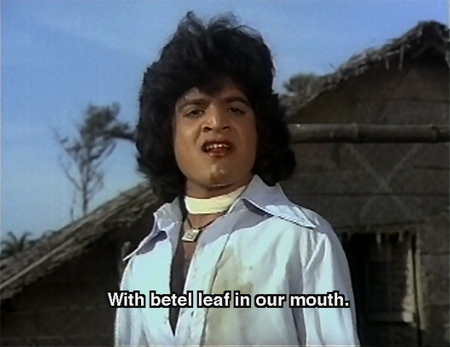 I have to admit to a certain amount of fatigue with this sort of 70s masala flick. After about the 100th film of this type, the outlandish sets/costumes/stunts/plots, etc., become tiresome. In general I can’t watch too many 70s films in a row…there’s a sleaziness and meaness to them that I find more than a little off putting. I, on the other hand, have all the appetite for masala of a new convert. Seriously, I didn’t watch Bolly till a few months ago. And it’s really through Memsaab that I learned to appreciate masala in particular. Otherwise, I would have tip-toed in and watched a Guru Dutt movie or two and left. I know exactly what you mean! (see comment in response to dusted off above)…This one definitely had those sleaze elements, although Mohan’s character and his philosophy helped mitigate it somewhat. 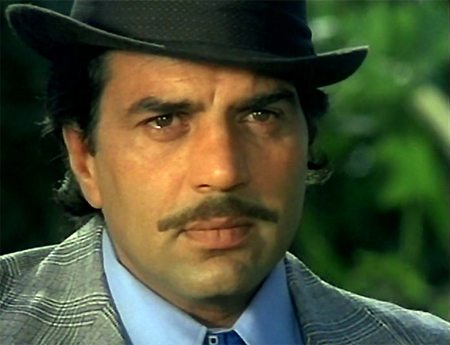 And of course Dharam himself was a Robin Hood type character rather than an out-and-out criminal. But honestly, the songs are just so FAB that they made up for anything else. Anita raaj is also actor Jagdish Raaj’s daughter. Anita Raaj is the daughter of Jagdish Raaj, the famous actor who is known to portray roles of police inspector in bollywood movies and was a successful hindi movie actress who acted oppsite Dharmendra(Naukar Biwi Ka), Raj Babbar(Prem Geet), etc. She quit acting after her marriage. Is this the same Shyama whom i saw in Aar Paar?! where she was looking gorgeous. Here she became very fat. Great change!!! But the Helen whom i saw in Mayur Pankh (1954) was looking cute. Here she is looking very gorgeous. Not just here, she looks gorgeous in every film. Here her age is might be 38, but still she looks very young and very beautiful. Can you please tell me that who is the other dancer in the song `Pyar Bada Hai Ya Jaan`? I’ll have to look for Anita Raaj in something :) Of course I know who Jagdish Raj is. 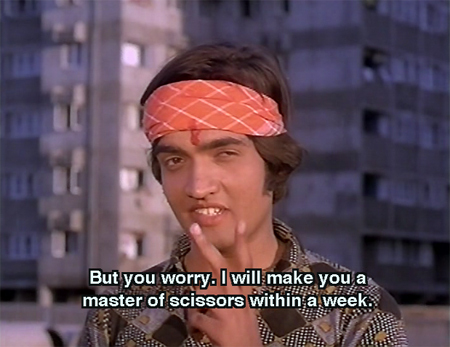 But my knowledge of 1980s Hindi cinema is somewhat sketchy, with good reason. Yes, this is the same Shyama. Still beautiful although yes, quite large :) And Helen still looks absolutely unbelievable. I don’t know who the other dancer is (maybe Ashoo? judging from the credits?). Had not seen her before to my knowledge. This looks like such a great Masala movie, full of heists, capering, and ewww-worthy scars! But i was very frightened by Munna’s jumbo eyebrows in that “hot-tempered” picture! Hai rabba, he needs some threading! And I cant believe that is Shyama from Aar Paar, she looks like she’s aged somewhat gracefully! OMGGG thats Mehmood Jr with the biggest hair ever, even bigger than my birds nest! Wow he grew up semi cute! “The Indian Luke Perry”? Ha ha ha! Isn’t he????? HE SO IS. I could not think of anything else whenever he was onscreen. Now I’m envisioning Amitabh as his Brandon Walsh. I think it was Iftekhar who played the role of Inspector a lot. I looked up wikipedia and that said that Jagdish Raj played police inspector in 200 roles. 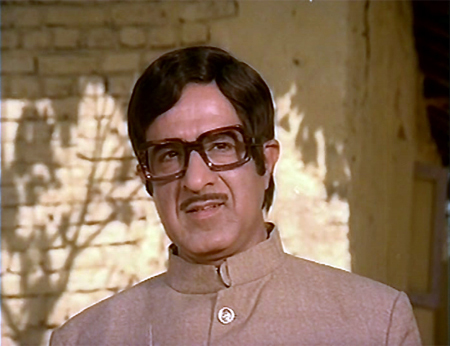 I recollect JR as the father roles (Jaanwar,father of Rajshree and manager of Prithviraj’s office) and manager in Junglee as in many others. Please tell me about this. JR also played bad guy in a Shammi Kapoor movie. Haven’t seen this Dharam movie. Memsaab, did you watch “My Name is Khan”?? Comments? I haven’t seen MNIK although I would like to. There aren’t a lot of theaters showing Hindi films in my area though so I usually have to wait for DVD. And I don’t like watching movies online…call me old-fashioned :) And I especially hate the way rajshri spams you incessantly after you sign up with them. I couldn’t get rid of them for the longest time. I didn’t have to sign up at all @ rajshri site!! Its open to watch online. Oh memsaab a lovely review again..!! i loved love Helen here….even Shabana Azmi looked superb in this film…but i didn’t liked the story of this film at all….the songs are superb esp.the Helen song…but they are not there in youtube…the special appearance of Hema Malini was nice too…. I can’t believe the songs are not all up on Youtube. They are really much too difficult to find, considering how very awesome they are! I was about to say the same! Bollyviewer beat me! Caution: if you are watching MNIK online this week, you are watching a pirated film, hurting SRK, Kajol, Karan Johar and all the Hindi film creators whom you love. I gotta tell ya, I don’t mind hurting the Indian dvd manufacturers or the production houses which sell off the rights to them to sell crap to us. The logos, the advertising, the totally indifferent quality…until they start caring about those of us who care about cinema, I have no sympathy. Another idiosyncrasy of Hingorani was: His movie titles would always be KKK acronyms. eg Khel Khilari Ka, Kahani Kismat Ki, Kaatilon Ke Kaatil etc etc. Glad to see that someone pointed out Arjun Hingorani’s KKK fetish. That is before Rakesh Roshan and Karan Johar went ‘K’ with a vengeance. Kab, Kyun, Kahan and Karishma Kudrat Ka are other notable movies he made. A notable exception was Sultanat which Hingorani was a co-producer starring Sunny Deol and Anil Kapoor which was also Juhi Chawla’s debut Hindi movie. Sultanat got another tag line, to complete Hingorani`s title fetish->Karnaame Kamaal Ke.It is not an exception. It was and is choc laden with so much nonsense that you need to watch it twice (at least) in case you miss all the fun (and gravity/ belief defying) scenarios the first time around. The songs I can’t remember too well, other than the title and ‘ek babloo pooches bali se’ , but I can remember dharmendra and a ‘diy gun’ on an airplane which looked like it was made of rubber or liquorice. I can also remember that out of nowhere towards the end, there is a mandir right in the middle of a quarry that has been bomb blasted. I could be wrong, but it seems to just appear for the sole purpose of facilitating some sort of reunion. The rest…A hugely coiffed jr mehmood (he sadly didn’t make the leap to ‘grown up’ roles ), too many ‘side heroes’, narendranath (sadly now deceased ) and the reliably loud and proud Dev Kumar sping his villanous best, are definitely enough of a reason to make this essential viewing. I really appreciate the way MEMSAAB loves the Dharmendra starrers.I like them too despite being in my fifties now. I watched Khel Khiladi ka on YouTube – How could I possibly missed a KKK movie from Arjun Hingoorani. I am puzzled at one thing though .I saw the name of character vamp artist Komilla Wirk on the star cast but could find a single scene featuring her in the 2hrs14 mins YouTube posting. Can anyone please tell me which scene Komilla acted in. If Dharmendra is the Indian Luke Perry, then can Rajesh Khanna be the Indian Jason Priestley? I just started watching Beverly Hills 90210, and its good to know that you are a fan as well. If Dharmendra is the Indian Luke Perry, then Rajesh Khanna shall be known as the Indian Jason Priestley. Just my opinion. By the way, I started watching Beverly Hills 90210, and it is great. Seems like a lot of Bollywood films in the late 90s copied this iconic show in terms of fashion. Also, when will you start reviewing films again? It’s been one year, and still no sign :((. Please come back, we miss you. P. S. Nice to know that you are a strong advocate of American diversity. Fortunately for me, the area I live in consists of staunch liberals/Democrats. P. S. Sorry , but I think Shammi Kapoor can be the Indian Ian Ziering. And Rishi Kapoor can be the Indian Brian Austin Green. Since you are a huge Shammi Kapoor fan, you may not agree with me on the first one, but I seem to think that their personalities are similar as both of them are pretty energetic, jovial and laidback. This show, Beverly Hills 90210 seemed to have a huge effect on me. Why do we need to compare Indian actors to younger (or older generation) of western / American ones? Neither Preistley nor Ziering (or any one of the ones mentioned) has tenth of the depth, Charisma or experience as the Shammi, Rajesh pr Rishi. We need to get out of this colonial attitude.